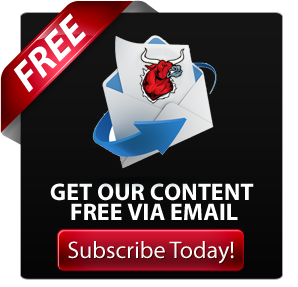 With so much excitement and major sales during the week of World Dairy Expo it can be easy to get caught up in the enthusiasm. To help potential investors or to guide those who love studying the market, here are 15 lots we will be watching during the two major sales (Planet Holstein and World Dairy Classic 2012). This HUNSBERGER ALCHEMY daughter has it all. 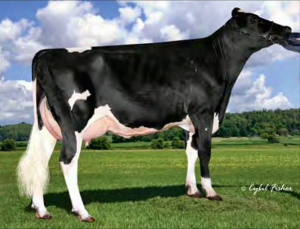 High GTPI (+2335), Red and maternal sister to KHW REGIMENT APPLE-RED EX-95-USA the 1st Aged Cow and Senior & Grand Champion R&W of World Dairy Expo 2011.Their dam KAMPS-HOLLOW ALTITUDE EX-95-DOM has had every bull put into stud make the active proven line-up. 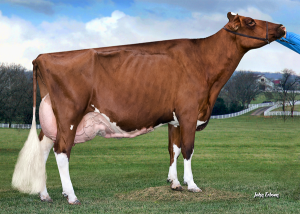 She already has three family members in the top 10 GTPI *RC and Red lists (SCIENTIFIC THE BIG APPLE-ET *RC, KHW SHAMROCK ARALYN-ET *RC, and FAR-R-LA ANAHEIM ANGELIE-ET *RC) with herself being the #3 Red GTPI heifer in the USA. With this cross, you can expect this heifer to have an extremely well attached udder. Alchemy is a good mating on Altitude as she has proven to produce progeny with a touch straighter leg. It also appears to be a good corrective mating for the rump structure. 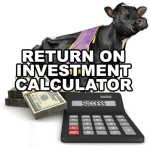 In RI-VAL-RE ALCHEMY NIKOLE you get the #1 GTPI *RC or Red female, and the #1 $NM *RC or Red. However, unlike Adeline, this cross of Alchemy on RI-VAL-RE SUPER NIKE does cause me some concerns in what her rump will be like and as well concerns on cleanliness of bone. Though she does rank as the #1 *RC or Red and will have plenty of demand for embryos f, you still need to make sure that she has the potential to be a VG 2yr old. However, this heifer does have a nice balance of production, durability and health & fertility. Also from a marketing perspective, when the only picture you have to use is the full sister to the 2nd dam, that causes me concerns. Another one to watch from the Dellia family will be COOKIECUTTER MOG HANKER and COOKIECUTTER SHMRK HAZE (Who was originally scheduled to sell in the International Intrigue sale). Sired by Mogul and Shamrock respectively these heifers are from COOKIECUTTER MOM HALO VG-87-2yr (Who also is set to sell at the 2012 Sale of Stars at the Royal), the dam of COOKIECUTTER PETRON HALOGEN the #1 GTPI bull in the breed (GTPI +2690). Just like Hue (Lot #9) these heifers have it all: production genomic test and type. 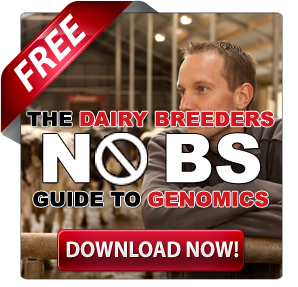 As far as genomic tests go these heifers are toss-ups to choose between. You will have to go old school to figure it out. Use your eyes to determine which one has enough frame and rump structure to score VG as a 2yr old. (Note also selling in the World Classic sale is their Supersonic sister who has slightly lower genomic numbers). FUSTEAD MOGUL LANA is the #24 GTPI heifer in the breed. Lana is the Mogul sister to S-S-I DOMAIN LITHIUM the breeds #2 GTPI bull with progeny on the ground. She has no Planet, Shottle or Goldwyn in her pedigree. Lana possesses outstanding production, durability, and health and fertility numbers though they’re not quite as high as her full sister FUSTEAD MOGUL LILAC (whose numbers are about 7% higher). Her genomic test would indicate that she should easily live up to expectations though I will be looking to see if she has enough body depth and frame to go VG as a 2yr. For those of you looking to get into the hottest genomic families in the world, AMMON-PEACHEY SHAUNA VG-87-2YR-USA this is a great opportunity. 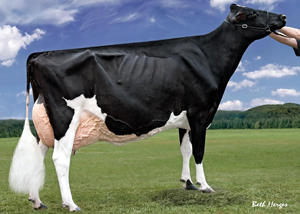 There is no doubt that Robust has been the best mating on Shauna (Read – Ammon-Peachy Shauna – 2012 Golden Dam Finalist) and DE-SU BKM MCCUTCHEN is a great follow up cross, combining two of the biggest index families in the world. With eight females to choose from you are pretty much guaranteed to get a list topper. With so much selective mating, it’s getting harder to find list toppers that are outcrosses to the major bloodlines. In BUTZ-HILL OH MY-MY you get no Shottle, Bolton, or Planet in the pedigree and DGV for LPI over 3400. On top of that her 3rd dam is none other than EASTSIDE LEWISDALE GOLD MISSY EX-95-CAN. This cross is a great blend of production, durability and health & fertility. Though watch for her to have slightly less type than expected. A close inspection of the heifer will reveal if she is a potential VG 2yr old, and if she passes, you may have an extremely rare genetic package. (Note also selling in the World Classic sale is her Shamrock sister who has slightly lower genomic numbers). Selling as the second lot is the daughter of the other expected contender for Grand Champion in the Holstein show HARVUE ROY FROSTY EX-97. However, for Frosty this is become second nature to her, as she has been Supreme at Madison in 2009 and 2010. 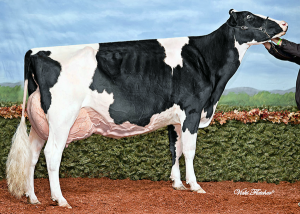 It`s interesting to surmise, how the daughter of Hailey drew lot 1 status compared to the daughter of the already ‘been there done that’ HARVUE ROY FROSTY EX-97? Maybe it is because of the calve’s actual conformation? This cross causes me the same concerns as the Atwood out of COOKVIEW GOLDWYN MONIQUE VG-89-3YR-CAN (Lot 1 in the Planet Holstein Sale), in that you may have too much Goldwyn in the pedigree? 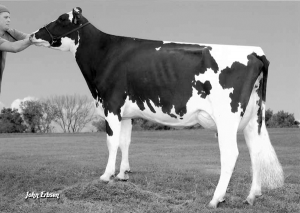 While there is no doubt that Goldwyn has been the most dominant show sire of the past decade, I am wondering if his son FUSTEAD GOLDWYN GUTHRIE will bring the needed mobility that this cross needs. What happens when you combine probably the most popular young show cow in the world, CRAIGCREST RUBIES GOLD REJOICE VG-89-2YR-CAN with what could be the next great type sire, REGANCREST-GV S BRADNICK (read more – 7 Sires to Use in Order to Breed the Next World Dairy Expo Champion)?The answer is you get CRAIGCREST REJOICE AYAME. While there has been much discussion among show breeders if they should use high type genomic young sires on great show cows, that is exactly what Elgin Craig did with this mating. On paper, it is an amazing cross. The heifer has Parent Averages in the double digits for all major type traits. While many might argue that Rejoice did not need much improvement, Bradnick does bring the rump improvement that was needed based on sire stack. 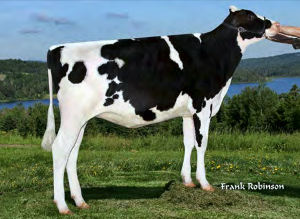 In addition, what a sire stack it is, Bradnick x Goldwyn x Dundee, that is a potent type stack. If this heifer lives up to her sire stack, she could be a very special one in her own right. For those of you that would prefer to invest in a little more established show stack, there is Morsan Miss Demeanour. 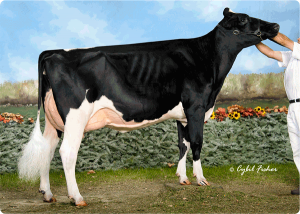 Demeanour is an Aftershock from EASTSIDE LEWISDALE GOLD MISSY EX-95-CAN. Here you get a proven sire that is (+16 Conformation, +3.32 PTAT) from last year’s Supreme Champion. However, it will be interesting to see if this heifer will have enough frame and capacity to compete at the highest levels. For those of you looking for an index fix, there is DE-SU ECOYNE 2043. With a GPA TPI of +2501 and GPA LPI of +3642 this heifer is one of the highest anywhere in the world (#19 GTPI in the USA). Those not 100% confident in genomics may call this a risky play (The French maternal brother to CO-OP BOSSIDE MASSEY and cow family still to prove itself on the proven sire side). 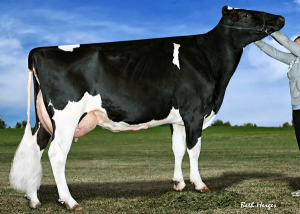 This heifer has DGV values 9% higher than her already world leading indexes (DGV LPI +3967). She has some of the highest production, durability and health & fertility numbers I have ever seen, but it is the type cross that has me concerned. There is no doubt this heifer will have an outstanding udder. I will be watching to see what how clean her legs are as well as how much frame she has. These are both limiting factors of her dam and sire. (Also note that since so little marketing has been done of the family you will be pulling the bulk of the work yourself. The numbers are great, but that is only half of the story). For those that want to dial the genomic dial back a notch, and kick it a little more old school, have a look at SPEEK-NJ ATWD DELLA RAE. Here you have a marriage of the Adeens and the Roxies. The number of World Dairy Expo winners in this pedigree is outstanding. 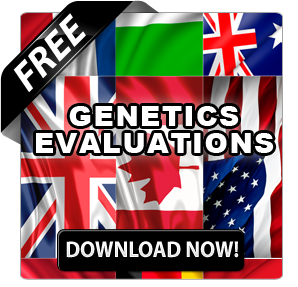 You have a potent type sire stack with the genomic test to back it all up. The interesting part about this lot is that it’s not only her that is up for sale. They are also offering 11 pregnancies, so you are able to kick start your program in a big hurry. Therefore, if you believe in the heifer, you are able to hit the ground running. It will be interesting to see what price will be paid for such a large package from a virgin heifer who is not an index topper. 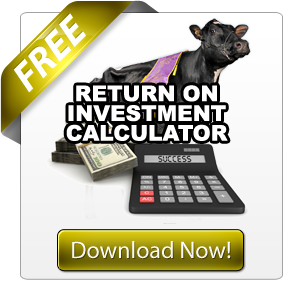 In all the excitement of World Dairy Expo there will be money flying everywhere. From the show cows that will sell in the barn to the many animals selling in these and other sales a, there will certainly be lots to talk about. For those who are wanting to get a head start or just see what all the hype is about, these lots will make sure your basis are covered.